“Neither have I.” She admitted, almost as shocked as I was by her own remark. If Colette has never seen these, they must be REALLY rare. We order 2, one white and one purple and 2 Icelandic, to compare. For starters, the Brittany boys are bigger beasts. The tongues of row are also bigger; you can actually sink your teeth into them. The complexity is mind blowing! Red fruits, meaty, ginger, flowers. 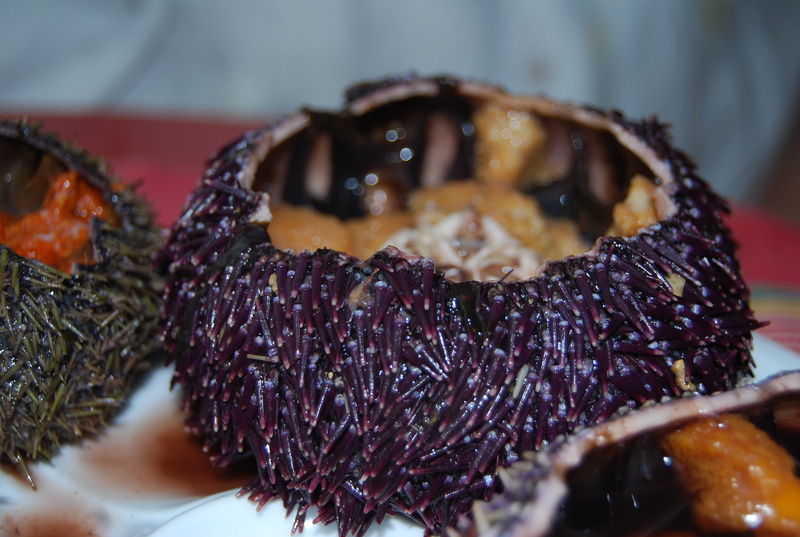 All of what we love in the very best sea urchins. The Icelandics are not in the same league here. They are very good, but seem so simple next to the Brittons. Brittany sea urchins only appear at my fishmonger about 3-7 days per year, and they are usually the same color as every other sea urchin, that is dark brown. Maybe these are the ones the Japanese used to buy, but now their economy is crashing?